During the month of May, South Street Art Gallery in Easton will host a one-woman show entitled “Cuba, Faded Beauty,” featuring the works of Bruce Bingham and her plein air and studio paintings from a trip to historic Cuba. 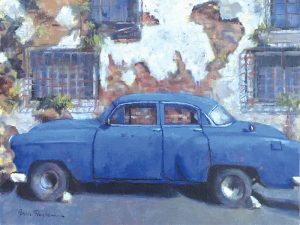 The exhibit will be open from May 1 through 27 with an opening reception on Friday, May 11 from 5 to 8 p.m.
“Blocked In Cuba,” by Bruce Bingham. Bruce Bingham has spent the last decade of her life as an expat, living and traveling to beautiful and exotic places where she has spent time capturing her experiences on canvas. Bruce’s work has been collected in 14 different countries, both privately and corporately. When she returned to the United States, it was a painting trip to Cuba that sparked her creativity and set her on an exciting journey in her life’s pursuit. In Cuba, along with 100 other painters, Bruce preferred painting the grungy street scenes of the city over the beautiful vistas, the crumbling patina providing a dilapidated but magnificent inspiration. From childhood, Bruce has loved drawing and painting. 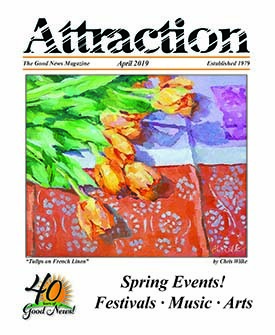 She received a BFA from the University of Oklahoma and has been painting in oils and showing professionally ever since. For more information about Bruce, visit www.brucebingham.com. For more information about South Street Art Gallery, visit www.southstreetartgallery.com.